All too often, businesses rely on fragmented processes and systems that are ineffective. This inefficiency isn’t a result of your team, it is due to the lack of integrated technology that can help you streamline and automate important aspects of your sales and marketing efforts. If any of these are part of your daily business life, then chances are you are missing out on some serious productivity. To effectively develop a cohesive business process and to gain a holistic view of your customer, you need to collect data. Data will drive your sales and marketing process. Many still assume sales and marketing are separate entities, however, they are one in the same. Marketing uses sales to learn more about their target market and effective efforts, and sales uses marketing to attract and nurture their clients down the funnel. The two are equally dependent on each other. When the two are fragmented or do not speak with one another, neither knows if the established system is working to sell more and engage the leads and customers. Just as the two departments in an office working together, so should the software you choose to implement. Why? Data integration: multiple data points from both sales and marketing together to give you the most informed picture of your leads and customers. Enhanced productivity: All the data either team needs is in one platform, already synced and ready to access in realtime. Lower software costs: Instead of investing in two, three, or more software systems, find one that fits your business needs. Integrating systems can be costly and time consuming. A better customer experience: When you know the customer, you know how to serve them. If you know they are a skier, you will not show them snowboard specials, for example. Do you see how fragmented software can work against you and your business? Success is largely dependent on how you run your business and how you cater to your leads and customers. CRM is no longer enough. You do not want just an online rolodex. You need email marketing, lead scoring, analytics, third-party integrations with popular apps, and more. Take lead scoring, for example. Lead scoring helps sales professionals qualify leads and see whether they are sales ready. However, much of what marketing does plays into a lead’s lead score. Did they download an eBook? 5 points. Did they open an email? 1 point. Are they a decision maker? 5 points. See how that works? Without marketing creating the content and tracking behaviors, sales wouldn't know where their lead was in the sales process. I am always impressed by salespeople who know their stuff when they call me and guide the conversation with information that is relevant to me and what I’m looking for. 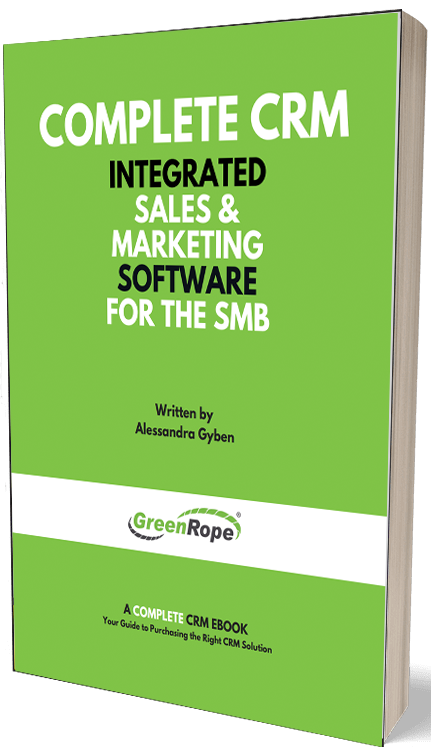 If you are in the market for a CRM or currently stuck in a rut where your software is concerned, it is time to search for a system that is going to grow with you. An integrated system is sure to get you to where you want to be faster. Just like a car, a business works best when all the pieces are working together. Are you ready to put all of your sales and marketing under one roof? Click here to get a live demo.